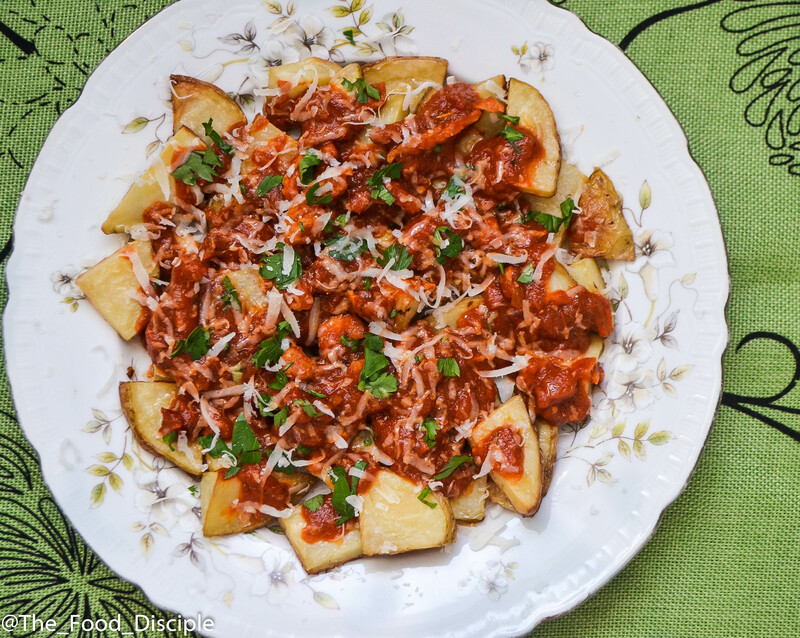 Patatas Bravas is one dish I believe everyone should try, and it is just absolutely tasty. 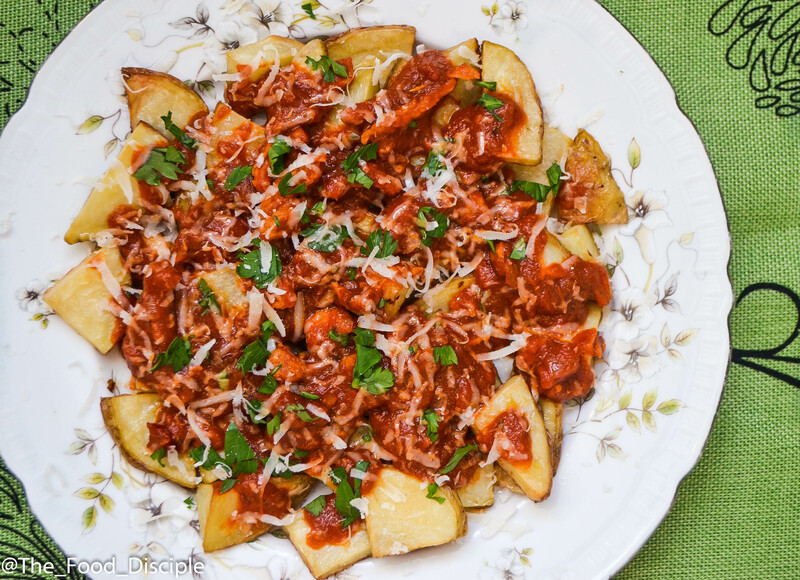 Patatas Bravas is a native Spanish dish that is usually enjoyed as an appetizer in most bars. I used to work at a Mexican restaurant and I cannot recall how much we had to serve or how many times I have had to prepare this for customers; what I can say is that it is absolutely tasty. What I love about this dish is how crunchy the potatoes are after it is fried (nicely salted) and the sauce is so sweet that it soaks right into the potatoes and let me not forget about the cheese and the lemon zest topping; this just puts it all together and it is party in my mouth😋. I added pork meat to my sauce because I cannot eat any food whatsoever without any form of meat😀, however this recipe will work without any form of protein. There is a beautiful balance between sweet and savory and the lemon zest gives it a little zing; this is just a perfect appetizer to get your taste buds going. I would love to hear your feedback on this recipe. Step 1 To prepare potatoes, peel, clean and cut potatoes into chunks. Toss in salt and grill on 375 F for an hour 30 mins. 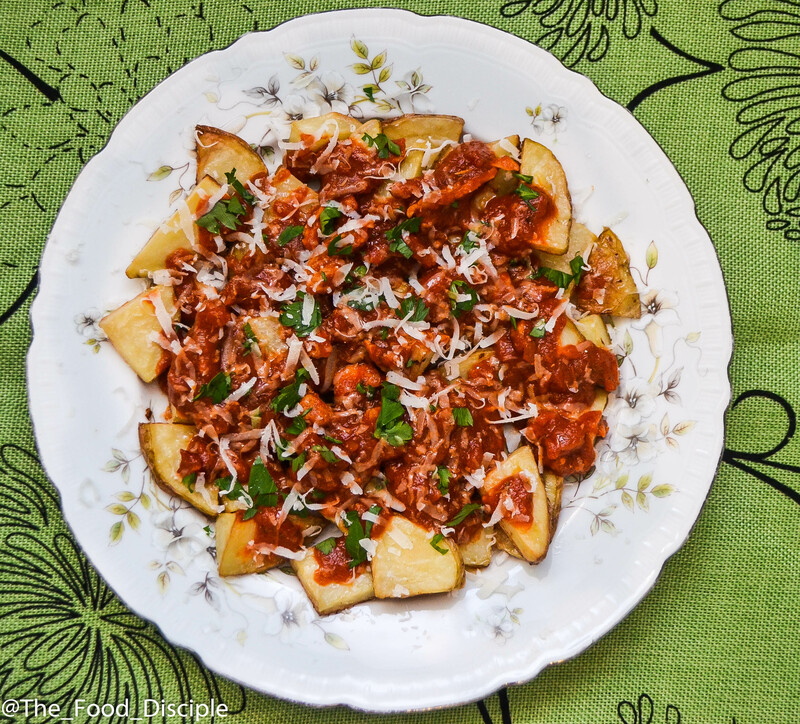 Traditionally patatas bravas are deep fried, if you would prefer frying, salt and fry potatoes. Toss in a little salt immediately it comes out of the oil. Step 2 To make tomato sauce, heat up oil and butter in a saucepan and heat on medium heat. When oil is hot, add onions and saute until soft and translucent. Add 1 tbsp of paprika, 1 tbsp chili flakes and saute for 1-2 minutes. Add garlic and saute for an additional 1-2 minutes. Step 3 Add tomato sauce, sugar, salt and remaining chili flakes and paprika. Reduce heat to medium low and cook covered for 15-20 minutes. Taste for seasoning, adjust with salt if needed and add more chili flakes if you want it more spicy. Add your pork and cook for an additional 10-15 minutes. Step 4 Your tomato sauce is ready!! Step 5 Serve sauce on fried/grilled potatoes, top with cheese, parsley or basil leaves and lemon zest.